So a customer to the shop wrote a little shopping experience at Via Bicycle. It is fun and whimsical and gives you a little insight, especially if you are not able to visit us. We find bikes for people and we usually don't curse. . . .in front of the customer. "Perhaps, the lifestyle began almost 27 years ago when Curtis set up shop on Ninth street, right off South, with four floors of bicycle Mecca. However, before the trademark ‘stache, Curtis was a kid growing up in rural upstate New York, pulling rusty bikes from trash heaps and breathing new life into them. It explains the scars on this hands and the way his thick fingers nimbly repair the tiny parts of a bike tire as we talk." full article is here at aroundphilly.com. Part of the pictures series. 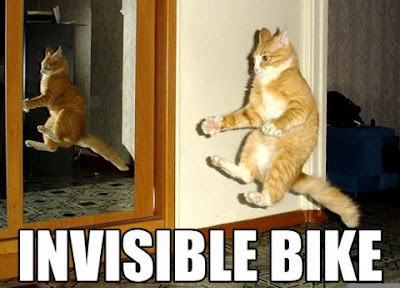 This time we have a Moulton, Omelenchuk, and an invisible bike. The Moulton was build during the period that Huffy was subcontracting them to import cool bikes(they also imported a super cool Carlton with Cappela lugs, and translucent paint over a chrome frame. My coworker Matt has one). This Moulton has a Sturmey Archer 4 speed internal hub and uses 17" wheels, that Moulton had specially designed and made. The Omelenchuk rear wheel in a Omelenchuk frameset is very nice. There is not much available internet about George Omelenchuk, which is a shame. He was a local tinkerer and built and manufacturered a lot of his own components including stems, hubs, rims, etc. The hub was made by him and was on his wife's Jeanne's track bike. She won national titles on her bikes 5 times. here is a little blurb about Jeanne-here. Here is a little blurb about George OmelenchukBike Cult website. Pictures 3- this time it's personal! early 1970s Jack Taylor "cyclo-cross" bike framest. It has brazeons for cantilever brakes but vertical rear dropouts and no eyelets for fenders. It also has round fork blades, typical of track bikes. I got the frameset with a campagnolo Nuovo Record headset and Mafac Cantilever brakes, but I have since used those parts for other projects, so just a frameset now. 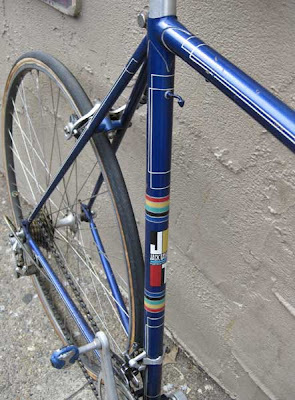 58cm seattube. 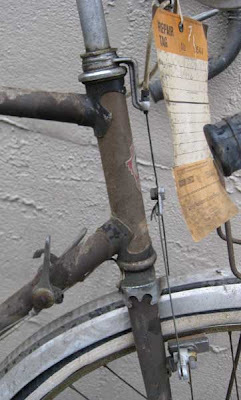 this posting includes an early version Campagnolo headset, Simplex 543 rear derailleur, an Ottusi modified Brooks saddle, Nice late 1950s Frejus track bike, and then a set of toothed rear dropouts to be used with Campagnolo Cambio Corsa. 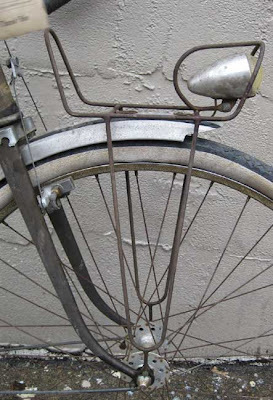 The next few blog posts will be random pictures of cool interesting bicycle and parts. this batch includes a nice repainted Tribune Blue Streak, with some incorrect parts, and a nice original Schwinn Aerocycle. 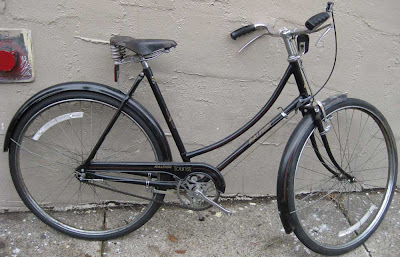 Raleigh is best known for their black "English Racer" bicycles, made the ever popular, Sturmey Archer 3 speed equipped, bicycle for over 80 years. 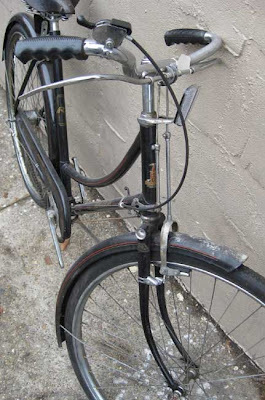 To the casual looker, the Raleigh bicycle from the 1930s is no different than same model produced in the 1970s. A perfect example is the Raleigh Tourist. Barring some minor details, the Tourist model known for it's larger wheel size (28" x 1 1/2") and rod -actuated brakes(rather than cables), remained unchanged for decades. 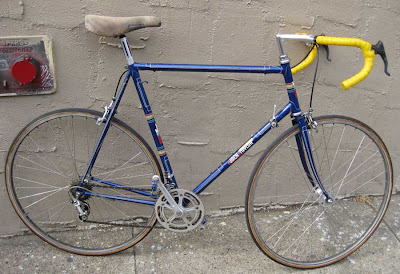 It is a common mistake that people see these bikes as early Raleighs, even though Raleigh produced this model into the 1980s. This particular Ladies model has a hub that is dated from 1978, and dating Raleighs this way is fairly accurate when the wheels are original to the bicycle. 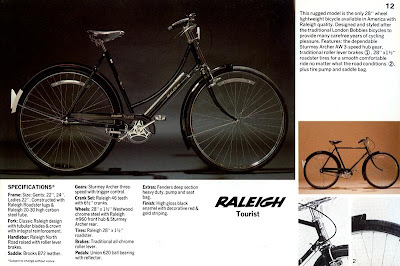 The 1977 catalog scan was borrowed from Retro Raleighs , an invaluable source of catalogs and general information about vintage Raleighs. Classic Lightweights UK website is an awesome resource guide and great place for vintage British eyecandy. I have linked some items before while blogging to this website, but I feel that it deserves it own post. It is valuable to collectors and restorers much the same way Classic Rendezvous is, but they have taken a more micro approach, focusing on vintage British lightweights and components, compared to the more macro, broader scope of all vintage lightweights that Classic Rendezvous deals with. These are some of the pictures from the website showing some truly British ideas and designs. Vibrant stays on a Hetchins, Shellwin's cool hub flanges, curve seattube Jack Taylor, Burlite brakes, and a Baines International radical frame design. Louison Bobet was a very famous French racer, best known for his 3 consecutive Tour du France victories. He raced for the French bicycle manufacturer, Stella for many years. He was forced into retirement after a car accident. This bike is mid-level 1960s touring bike. Fr0m a distance, it looks like a typical French touring bike complete with racks, fenders, lights and even Guidonnet brake levers. But upon closer inspection, one notices heavy steel rims, cottered steel cranks, and 2nd tier components. That is not to mention the lax attention detail on on the frame and lug treatment. 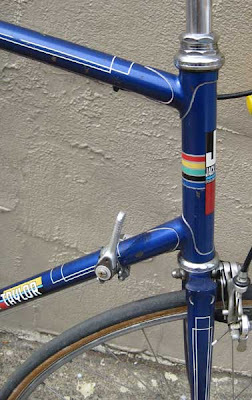 The bike was outfitted with Huret Allvit derailleurs, with a 600 front derailleur. The brakes are CLB cantilevers and CLB guidonnet brake levers for top of handlebar braking position. 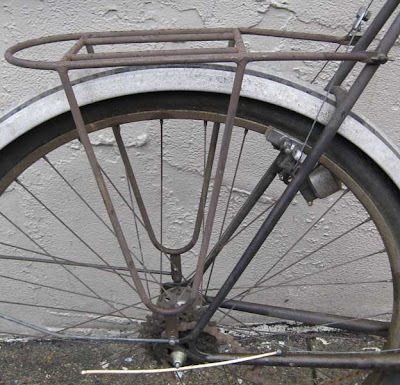 The bicycle also has a set of racks with a cool protector around the headlight. I guess this bike would be an entry lever touring bike. This bike is what collectors would call "barn fresh," it is in the same state it has been in for a really long time, taking the date from the tag hanging on it, since 1983, over 25 years untouched. There is much to be upgraded on it to make it a more reliable and lightweight bike but might make a good rider. 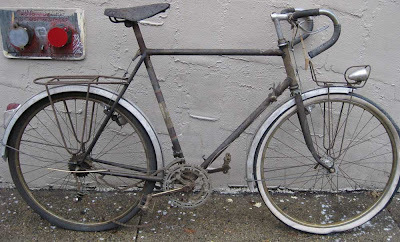 More information on Louison Bobet bike here on Classic Rendezvous. Lytaloy was a product of Hobbs of Barbican. They produced brakes, headsets, cranksets, bottom brackets, and pedals. It is thought that the components were produced by outside contactors and they were regarded as top of the line parts. Lytaloy was very expensive at the time. 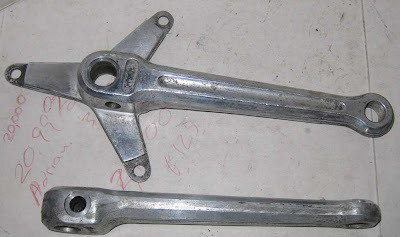 The cranks look great but were prone to breaking. 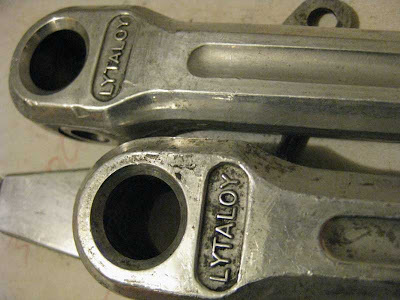 This set of cranks looks suprisingly well for a 50+ year old cranks that usually only lasted a couple years, or less. This is a late 1960s Triumph 3 speed bicycle that was recently purchased by a friend of mine. They were looking for a classic city bike for light tooling around town and doing it in style. 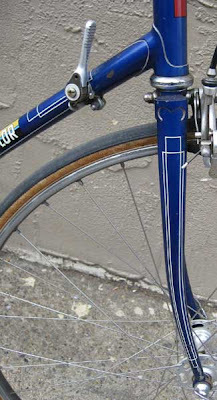 Triumph, at this point, was a subsidiary of Raleigh Industries and building the popular "English Racer" 3 speeds. The bike with fenders, a chainguard, and upright handlebars makes for an excellent city commuter. 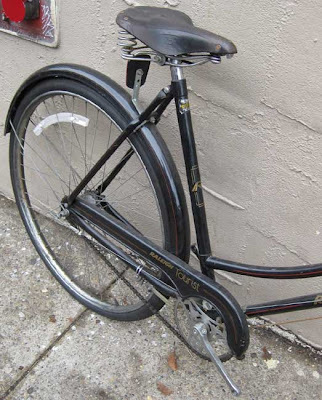 Most riders of these bikes find that the Sturmey Archer 3 speed internal gear is more than adequate for a city like Philadelphia. I find that a lot of my commute, I usually only use 2 gears. This bike will probably end up with an employee or friend of the shop, as we always like to treat our friends. Finding beautiful bikes like these are always excellent to find and even better when they "stay in the family" and you get see them enjoyed. I love city bikes. I don't understand people that ride bikes in the city without fenders and chainguards, and dare I say. . . upright riding position!! The search for brake levers for the upright riding position leaves the rider looking either at current stock(modern plastic/aluminum Mtn. bike levers) or older brake levers. Most brake levers found on upright bikes were plain Weinmann or Dia Compe alloy brake levers that haven't changed much since the 1960s. They are nice and look at home on any classic bike, but I wanted something a little different. So I started looking at weird French brake levers. 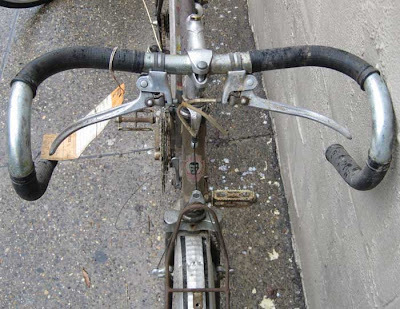 On my current city bike, a 1960s french Rochet road frame set up with Honjo fenders and Velo-Orange Porteur rack, I installed Tektro inverse brake levers. They are very nice and have a spring return. As nice as they feel, they have nothing on Frexel.